The first thing you need to do is setup the Nest Namer so it can work with your SLBP account. 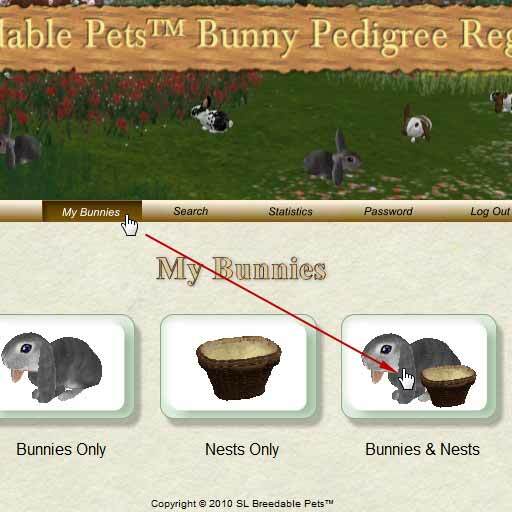 You need to login to the website at www.slbreedablepets.com and find the ID of the last bunny or nest you registered. Where it says "Registry ID" at the top of the left most column to sort them by number so the arrow icon is pointing down. Look forconsistant numbers and copy the highest one. 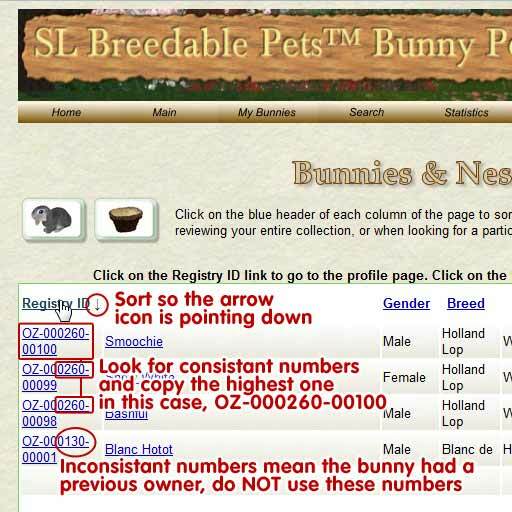 Inconsistant numbers mean the bunny had a previous owner, do NOT use these numbers. When you have that ID click on the Nest Namer and choose "Options ->" then "Setup SLBP". The first time you do this it will tell you your ID is not setup and to put a number in. Type or paste in your ID number. It should then tell you it is set up and let you know what your next ID number will be. Rez a SL Breedable Pets Nest Registration Ring on the ground. Make sure there aren't any scripted objects nearby (like random jumping bunnies). Place a nest in the center of the ring and touch the nest. This will bring up a menu from the nest. 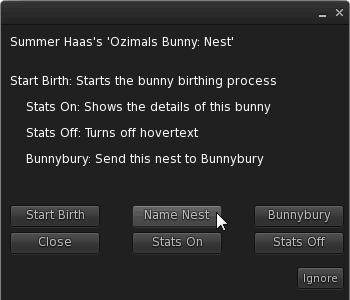 Click the "Name Nest" button. Highlight and copy ( ctrl+C ) the last six(6) lines starting with "Mother:" all the way down to the end of "Shade: Type" (it's ok if you also copy the "Ozimals Bunny: Nest:" part or other words in the chat. The Nest Namer is smart enough to figure out what it needs). and paste ( ctrl+V ) it back into chat. The nest should reply that what you pasted is now its name. Nest step is to register the nest. Click the Nest Registration Ring and choose the correct parent option for your nest. It will then ask you to copy the stats for parents, fur, eyes, ears, and shade and then ask for confirmation (for more help on this please see manual that came with your SLBP account). and paste ( ctrl+V ) it back into chat. The Nest Registration Ring should proceed as usual. You should find that your nest is now tagged with the same number as registered.